The Best Law Firm SEO Provider in 2019 - Find out why! Search engine optimization for attorneys is one of the most competitive verticals in the SEO world. Each year, the number of law firms who are increasing their spending on online marketing continues to rise. We know that choosing the right company to handle your law firm’s online marketing is not an easy task. There are plenty of legal marketing companies who will tell you they are best lawyer SEO company around. How do you know which company to trust? As they say, talk is cheap. If you want to have great online visibility for your practice, you need someone with a proven history of getting results in the legal industry. If you want to aggressively market your practice, iLawyerMarketing is the law firm SEO company for you. Choosing the right SEO company is crucial to your firm’s marketing success. Choose the wrong agency or “SEO expert” and you will be wasting time and money, as well as missing out on generating leads and new clients. Most companies that turn to iLawyerMarketing to handle their digital marketing have been down the path of choosing the wrong provider. Their law firm website does not rank as a result of poor SEO being conducted or their websites have been penalized by their vendor for “over-optimizing” their website. This is quite often the result of choosing a law firm SEO service based upon price. If you don’t realize this now, it’s important that you understand that in 2019, there is no such thing as a low cost SEO provider. From a business perspective, this is simply not realistic. We have been conducting organic search marketing campaigns for attorneys for over 12 years. In this time period we have seen law firm SEO drastically change. What used to be much easier is now much more difficult. The time and effort required to do search optimization the right way makes low cost SEO impossible to offer. If it sounds too good to be true then it probably is. Take a look at this chart of SEO spending in the U.S. Each year, the amount of spending increases as more and more websites compete for business on the Internet. By 2020, SEO spending will approach $80 billion. Competition amongst law firms will continue to get tougher and tougher every year. While this chart shouldn’t scare you from engaging in PPC campaigns, it should underline the importance of not relying on PPC alone for your online visibility. We strongly believe your Internet marketing should include SEO and paid search if budget allows. Based on the results we have been able to achieve for other law firms, we believe we are the company that is the right choice for your law firm. Can we help your law firm? Discuss your marketing objectives The very first step in our process is to have a discussion to find out what your marketing goals are. Is SEO the answer? For many law firms yes, but SEO is not always the right option for everyone. In some cases depending on time and money, paid search such as our PPC for law firms service is a better fit. If we believe we have a solution that will help you meet your goals we move on to step 2 in the process. If not, we will let you know right up front so we are not wasting each other’s time. Evaluate your current website(s) and domain name(s) Next we analyze your law firm’s website and domain name to see if it can be used. Having high visibility on Google is a crucial first step to generating leads online, but if your website fails to convert your visitors then you are wasting money and losing out on new cases to your competitors. Additionally, depending on how your website was built, it may be contributing to poor rankings and prevent you from ranking high on Google. Our head technical SEO expert will analyze your current site to assess page load times, crawlability, mobile versions and overall SEO friendliness. In terms of your domain name, we will conduct a backlink analysis to make sure you don’t have a link profile that would prevent you from ranking high on Google. If your domain has a manual or algorithmic penalty as a result of bad links or over-optimized anchor text, a new domain name may be required so you are not wasting time and money trying to optimize a penalized domain. Analyze the competition in your market We will look at the 1st page of Google search results for the keywords you want to rank for to determine who your online competitors are and what level of competition you are up against. We further analyze the top 5 to assess the strength of the competition – since that is who you will be competing with online. How do those websites compare to yours? Which sites have the best opportunity to convert website visitors? How strong is their SEO? What tactics are they using to earn high rankings? What areas of opportunity do we see? Strategize to win Our SEO experts will come up with a tailored solution to help you start generating leads and new cases. The plan we come up with will be based on what we have found to be most effective for our clients who share similar goals in similar markets to yours. Depending on how aggressive you want to be with your marketing, we will develop the right online marketing strategy for you. Whether it’s just SEO or one that uses a combination of both SEO and PPC, we will use our 10+ years of experience in law firm marketing to put together the right plan for your law firm. Call us today and ask for a demo from our marketing experts to see what we have been able to do for other law firms in the most competitive areas of law including personal injury, criminal defense, family law, employment law & more. How long will it take for my site to start ranking? One of the most common questions we get asked is “How long does SEO take?” and it’s a question everyone should be asking. The time it takes to start ranking for competitive keyword phrases will depend on many different factors, including how competitive the keywords you are targeting are, where your site is currently ranking, and what level of trust your website has with Google. In most cases you will see ranking improvement for many keywords within 90 days. In some occasions when we find poor on-page SEO issues or technical issues on the site we can improve rankings within the first 30 days. In other occasions where it’s a very competitive market, trying to rank for your most competitive terms can take a year. For example, if you are a personal injury law firm in New York and you want to rank for “New York accident lawyer”, it will take longer than trying to optimize for car accidents in Dayton, Ohio. Put yourself in Google’s shoes for a moment. The great majority of your revenue (remember you are Google in this scenario) is generated as a result of people using your search engine and clicking on the ads that appear in your search results. People use your search engine because they know that when they use Google search, they are going to be given a set of search results that will usually help them find what they are looking for. Wouldn’t you want to protect your revenue by making sure you are providing the best results possible? Yea, you would. Google’s #1 rule of their business is “Focus on the user and all else will follow“, meaning they want to provide the best user experience possible. Providing relevant results and giving the user a great experience is the most important thing so they need to trust that your site is worthy of a high ranking for a users search query. 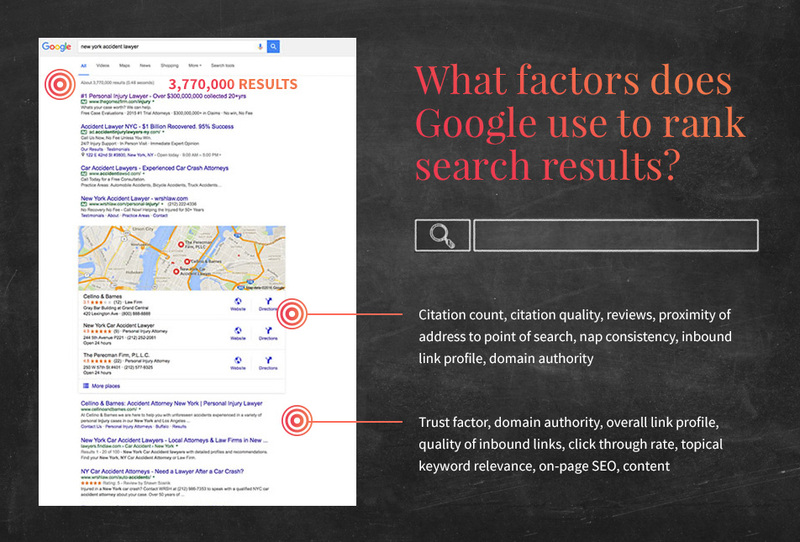 When it comes to law firm SEO, the landscape is incredibly competitive. Take a look at the following search and look at the number of results. A search for “Houston criminal defense lawyer” returns 993,000 results. Are there that many law firms trying to rank for that search term? No. Are there that many pages in Google’s search results? Yes. Your competition is not just law firms but any website that has content with those terms on their site. Before you can rank high in the search results, Google needs to trust that your site is going to provide a user with a great user experience. There are many signals Google uses to determine trust with your site including your site’s content, how users engage with it, how long they stay on your pages for, how many pages they view on average, how fast (or slow) your web pages load on desktop and mobile, the trustworthiness of websites that are linking to you and your overall link profile, the consistency of your business information across the web, brand signals, etc. Another reason SEO takes time is because search engines must process the changes made that involve your website. Nothing is instantaneous. Adding a page of content today doesn’t mean that page is automatically in Google’s index of search results. Googlebot (Google’s web crawler) needs to crawl your new page and update their index before you have the chance to appear in their search results. Another example is with inbound links. If another site links to your webpage, Google must crawl that page where the link now exists and discover the new link. Google also does not instantly give you “full credit” for that link. In many cases it takes around 90 days for that new link to have an impact on rankings (if any at all!). Many links have minimal to no impact on rankings and many law firm marketing company SEOs simply don’t know any better. What makes us better than most is we understand which links will have an impact & how to acquire those links. Why is lawyer SEO so expensive? It’s not just law firm SEO that is expensive, it’s anything that is competitive online. As the chart above showed, we are approaching $70 billion a year being spent on SEO services and that number will continue to increase. Over the past few years, SEO has become much more difficult than in the past because of changes in Google’s algorithms. Google is much better at being able to detect “shortcut” tactics that used to work such as buying links and creating low quality content pages. To us, this is a good thing because it weeded out lots of SEO companies that should never have been offering services in the first place. We are a white-hat SEO agency, meaning we follow Google’s guidelines when we conduct SEO. We do this because we want to build long term relationships with our clients and want to engage in SEO methods that are safe from Google penalties now and in the future. There are many law firms who have used law firm SEO companies that have used tactics that are against Google’s guidelines in order to try and get high rankings. Unfortunately for these attorneys (and fortunately for our clients who compete with them) many of these websites have been penalized and no longer rank. We know because we have been approached hundreds of times by law firms who have been penalized due to manipulative search marketing tactics. SEO for attorneys in 2016 is very different from years past. It requires more time, more money, higher quality content, a high level of technical understanding of how search engines work and smarter SEO’s. If you don’t have the budget to engage in proper SEO, don’t waste your money on low cost SEO. You are better off investing in PPC for your law firm. If you want more on why SEO for lawyers is expensive, we’ve covered it more in depth over here. Hover over this map and find your state and you’ll see another reason why SEO is not cheap. The number of lawyers competing for the same cases you are is large. According to the Bureau of Labor Statistics, as of 2015 there were over 600,000 lawyers in America. California and New York each have over 70,000 attorneys! Competition is fierce online, especially in major markets throughout the country where it’s not uncommon for law firms to be spending $5k-$50k (or more!) on Internet marketing, especially when it comes to Google Adwords advertising. While you don’t need to spend at that kind of level to generate leads from your website in the great majority of markets, it’s not realistic to think you can have SEO experts work for cheap. I tried SEO and it didn’t work. How are you different from other law frim SEO companies? First, our experience is what makes us different. We have been successfully optimizing law firm websites for over 10 years and have optimized thousands of websites. In the SEO world, experience is something that cannot be replaced. Someone who has been doing SEO for 2 years and has optimized 5 websites for example does not have the expertise or experience handling all the different situations that come about. Second, the results we have been able to achieve for our clients sets us apart. Ask us to show you specific success stories and we can show you not just our ability to get law firms to the 1st page of Google for competitive searches but more importantly we can share stories of how we have other law firms similar to you generate new cases online. No matter what area of law your firm handles, trust me we have handled it and had success. Should I choose SEO or PPC? The answer depends on many factors including your budget, how competitive the keywords you are targeting are, do you have time to wait for SEO or do you need to results now, etc. Every situation is different but we can help you decide what is the right fit for your law practice. For example, if you need to generate cases right away, a smart Google Adwords campaign is going to provide more immediate results for you. If you understand SEO is an investment and it takes time, usually organic SEO can provide a better long term value as long as you have a great company running your campaign. If your budget allows, we highly recommend that your Internet marketing campaign includes both SEO and PPC together. Content marketing is a way to market your business by creating content that is helpful or interesting to your target market. It’s a way of selling your law firm without “selling”. If you create awesome content and help answer the questions your potential clients have, you have a better chance of generating more clients as a result of the content that you create. It doesn’t stop however with the creation of content, and in fact this is where the hard work begins. Content creation combined with outreach, social media marketing and PR are all components of great SEO. Yes, SEO is dead. Just kidding, of course it is not…but old school SEO tactics are. SEO has evolved and today if you aren’t engaging in SEO methods that work in 2016, then you are wasting time and money. If you don’t have any content on your site that is “shareworthy” or “linkworthy”, you’re not going to be able to compete with your online competitors who are.